The topic of 'Policy' is of relevance to physiotherapy. Agreeing and establishing policy requires an outline of expected outcome. This primes services to implement policy detail through chosen frameworks. Physiotherapy representation in relevant health and educational policy is achieved only by understanding how to ensure our value is recognised. When major policy is due to be drafted, we need to provide information of relevance to the drafts and attempt to be included in the process first hand. The term ‘policy’ relates to a plan of action adopted by an individual or social group to guide decisions. Policy might be produced to determine foreign, health, insurance, monetary and security policies to name but a few. Older people are more individually distinct than other segments of the population.Not only might the age range of this group of people span upto 40 years, but diversity exists in respect of social class, race, ethnicity and culture; differences are reflected in values, customs and beliefs, political affiliation, levels of education and material well-being. It is important that policy reflects these variations. As with any ‘user group’, older people shape policy and practice. Older people want to be involved and are enthusiastic participants when given the opportunity to use their voice. Unfortunately, much policy and practice have been based on the assumption that older people are a ‘burden’, so resources fail to deliver their definitions of quality. In a review of their experiences, servicce responses and involvement in setting agendas, issues older people defined as central to their lives included advocacy, quality, views on ‘modern’ healthcare and money. Not only did this project highlight hitherto unrecognised needs of this population, population, but identified firstly that .successful change to policy depends on the meaningful involvement of older people in defining quality of services and quality of life, and secondly, that if programmes or strategies about older people did not have the fullest possible involvement of older people in their development they were unlikely to stand the test of time. Discussion Point Watch these clips on how policy is being shaped, or has impacted on the older population. A positive message is provided in the first clip about policy being considered to support an ageing population in Alberta - Alberta’s Ageing Population Policy; Compare this to the documentary about the impact of policy introduced by the Chinese Government aimed at controlling its population, with the country having to cope with increasing demographic imbalances. Health care policy has undergone change progressing from a model of treating ‘illness’ to a model of maintaining and promoting health. There is greater emphasis on the integration of health and social services, something of particular relevance to the care of older people. Many health policies are influenced by medical research and the concept of ‘evidence-based practice’. There is disagreement about the need for objectivity in research, the notion of hierarchies of evidence and the primacy of systematic reviews, with a request for a new emphasis on ‘knowledge-based practice’, recognising that the practice wisdom of health and social care practitioners and the lived experience of service users can be just as valid a way of knowing the world as formal research. This is particularly the case in groups that tend to be excluded, such as older people with dementia and older people from a black and minority ethnic community who can become involved as co-researchers. Internationally, the World Health Report, first published in 1995, is the World Health Organization’s leading annual publication. It provides expert assessment focusing on a global health subject plus provides country-specific statistics. It also provides countries, donor agencies, international organisations etc with information to permit policy and funding decisions, as well as providing professionals or those with personal interest in international health data. 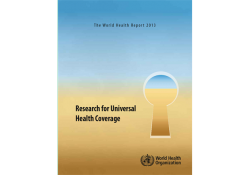 importance of research in advancing progress towards universal health coverage. In addition, it identifies the benefits of increased investment in health research by low- and middle-income countries using case studies from around the world, and proposes ways to further strengthen this type of research. Look up the most recent health policy of relevance to the country you are in as well as local policy where you are working or are on placement. Does the document tackle issues of relevance to the older population? With regards the local policy, does the final Business Plan specifically include physiotherapists specifically, or just medical and nursing colleagues? The paper uses Policy Case Study as part of the methodology to develop a conceptual framework for analysing the public-private mix of funding of physiotherapy in Ontario.